Take advantage of recreation opportunities including a spa tub and a 24-hour fitness center. This hotel also features complimentary wireless Internet access and a television in a common area. Centrally located near area corporations and Anaheim attractions, the new Holiday Inn Express Fullerton – Anaheim hotel is the newest hotel near Disneyland. The hotel’s location offers convenience without sacrificing comfort or peace of mind. It is the perfect home base, whether you are in Orange County for business or on vacation. 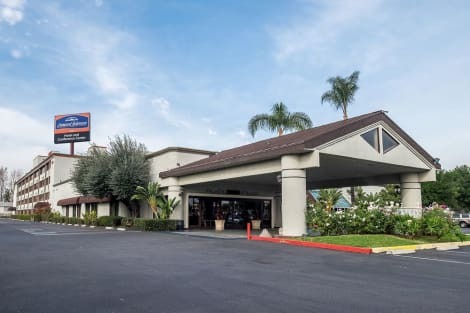 The hotel’s proximity to Fullerton area corporations such as Bank of America, B/E Aerospace, CKE Restaurants, Danaher, Kimberly Clark, Raytheon, St. Jude Medical and UTC Aerospace is ideal for professionals. Disneyland Resort is just four miles away. The Anaheim Convention Center, attractions like Knott’s Berry Farm and Crystal Cathedral, and sports venues such as Angel Stadium and Honda Center are only minutes away from our convenient location. Orange County is a shopping mecca, with MainPlace Mall and The Outlets at Orange nearby. Our new, contemporary guest rooms are among the first to feature our brand’s latest design, Formula Blue, which puts sleep quality and simplicity at the center of our guest experience. Our complimentary Express Start Breakfast provides a delicious variety of hot and cold breakfast favorites served in our Great Room each morning. Maintain your lifestyle with a workout in our Fitness Center, featuring the latest in equipment. We invite you to come experience why the “smart traveler” chooses the Holiday Inn Express Fullerton – Anaheim hotel today! Don't miss out on recreational opportunities including an outdoor pool and a fitness center. This hotel also features complimentary wireless Internet access, an arcade/game room, and gift shops/newsstands. Guests can catch a ride to nearby destinations on the complimentary area shuttle. Featured amenities include a business center, complimentary newspapers in the lobby, and dry cleaning/laundry services. Planning an event in Fullerton? This hotel features 5,730 square feet (532 square meters) of event facilities. Free self parking is available onsite. lastminute.com has a fantastic range of hotels in Fullerton, with everything from cheap hotels to luxurious five star accommodation available. We like to live up to our last minute name so remember you can book any one of our excellent Fullerton hotels up until midnight and stay the same night.